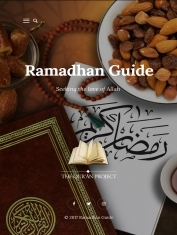 ‘Ramadhan Guide – Seeking the Love of Allah’ was originally a booklet published by The Qur’an Project. The publication includes short reminders, recommendations, daily checklist, targets, virtues of Dhikr, Dua’s from the Qur’an and more. The website was launched for Ramadhan 1438 [ May 2017] to allow more readers worldwide to benefit from the guide and allow us to expand the content gradually inshaAllah. At The Qur’an Project, we seek to provide materials and resources that will kindle and develop love for Allah Almighty, He is Most Loving and Most Kind. We hope readers benefit and ask you to please remember us in your duas.